I have a credit card I’d like to cancel, but I don’t know if I should. I’m afraid it’ll hurt my credit score. Today I’m going to walk you through in real time as I evaluate this decision. Then I’m going to explain how to cancel a credit card, no matter why you want to do so. That said, for the past several years I’ve been carrying a credit card that I don’t want or need. It’s a Chase British Airways card that I signed up for in 2011. It’s a fine card, but I never use it because I have better ones. My primary credit card right now is the Chase Sapphire Reserve, which I use for 99% of my personal credit transactions. Basically, I’m paying $75 per year — the British Airways card’s annual fee — for nothing…except to maintain my credit score. I don’t like it. I’d rather cancel the card and take a temporary hit to my credit. But is it bad to cancel a credit card? And if it’s bad, how bad is it? I’ve decided to document the process! Let’s find out together. Yay! It’s the same as reported by Credit Sesame. As of today, let’s call my credit score 816. Note: If you don’t have a Chase credit card and don’t want to use Credit Sesame, you can also get your free credit score from NerdWallet. The only catch? You have to create a NerdWallet account. Unfortunately, this Score Simulator is a general-purpose tool. It doesn’t let users exercise precise control over their input. So, for instance, I’m unable to model canceling my Chase British Airways card specifically. However, I’m able to model what happens if I cancel my oldest credit card. Because I cancelled all of my cards when I was digging out of debt in the early 2000s, my oldest card is a Capital One credit card that I acquired in 2007. That’s not too far off from the British Airways card that I took out in 2011. My current credit score is great. According to one score simulator, cancelling a card will have a minimal effect on my score. So, why am I still nervous? I’m not sure. To assuage my fears, I contacted credit expert Liz Weston, author of Your Credit Score. “Does cancelling a credit card hurt your credit score?” I asked, and I explained my situation. When scores are as high as yours, even a larger drop in points wouldn’t affect you on a practical level. Once your scores are in the 760 range, you typically get the best rates and terms offered by lenders. Scores take into account the average age of your “trade lines,” or credit accounts, as well as the age of your oldest account. That’s why you often see cautions against closing the oldest account. However, age of accounts is a fairly small part of your score, and the damage doesn’t happen immediately, since the closed account will continue to be reported and its age factored into your scores. A bigger deal when closing accounts is your credit utilization. Shutting an account removes the available credit limit from the calculations, and that may have a bigger effect on your score. 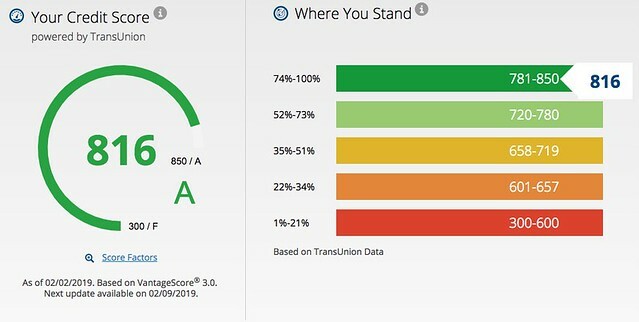 The credit score you’re looking at can (and probably will) differ from the credit score(s) a lender may use, which means the impact could differ as well. The formulas for VantageScore and FICO in general aren’t the same. Plus, they each have been updated (in FICO’s case, multiple times) and lenders may use older versions or ones that have been tweaked for their industries, such as the FICO Auto Score 8 for auto loans. That’s a fairly long answer to your quick question! In general, it’s a good idea to avoid closing accounts when you’re trying to build your scores or if you’re in the market for a major loan. Once your scores are high, however, closing the occasional account shouldn’t cause you undue worry. Weston brought up a point I hadn’t considered: Canceling a credit card affects not only my age of accounts, but also my credit utilization. I have a $20,000 credit limit on that Chase BA card, so cancelling it will mean that I’m using a larger percentage of my available credit. That said, I don’t actually carry any sort of credit balance. I pay my bills in full each month. As a result, my utilization should remain relatively low. Plus, if I do decide my score gets dinged too much, I’ll take the Credit Sesame approach to building credit: I’ll take out a new card, one without a fee. If I do choose to cancel my British Airways card, what’s the process? Closing a credit card account is easy, but if you decide to do it, you should do it correctly. Before you cancel a credit card account, pay off the balance or transfer it elsewhere. Never attempt to cancel an account on which you still owe money. I’ve heard horror stories of banks raising interest rates on people who do this. Contact your credit card company. You might be able to cancel your account online, but most companies make this difficult (or impossible). You’ll probably have to call. This so the sales rep can persuade you to keep the account open, of course. When this happens, remain firm. Take notes! Check your credit report. After you receive confirmation that the card has been canceled, it may take several weeks for the change to be reflected in your credit report. It is your responsibility to verify that your report is accurate, so keep tabs on it. Like me, you may also want to monitor your credit score to see if there’s any damage. Once you’re certain the account is closed, cut up your credit card! Hurrah! If you have trouble with compulsive spending, it’s best to cancel your accounts. Don’t just cut them up, but cancel them. When I was having trouble with credit, I canceled my accounts, which bought me time to learn to manage money responsibly without an ever-present temptation to spend. In the end, this all seems worth it to me. If I cancel my British Airways card, my credit score drops from 816 to 796 but I save $75 per year. Because I have no plans to make any moves that rely on my credit score in the near future, this sounds like a smart move. I’m going to do it! The post How to cancel a credit card (without killing your credit score) appeared first on Get Rich Slowly.